something i worked on quite a while ago when i wanted to mess around with the pen tool. (except for the details of the eyes, the text, and the bg gradient, everything else is 100% vectored.) as you can see, the vectoring style in this is really weird xD; (at least i had fun making hei's hair.) let's just say what with all the layering and stuff, i'm going a little abstract. not much of a concept behind the text and bg. >__< which is probably why i have no motivation to refine this piece. at least not as of right now. hei is from a scan i got some time ago as part of the prizes for a walling contest. the cityscape is some rough random tracing from two screenshots. Amazing. I love how you did the shading, especially on the hair. For the writing though, the sentence that says, "I beg differ" I think should be "I beg to differ." The vector is full of details and the slight shadow on his face blends really good. Again, congrats on the wonderful details! Hei's eyes is creepy.... It's like.. he can't see the light. wow hair is so great and his eyes are fantastic! o_O Where did you get such patience to vector all those shapes? It's very detailed and looks almost like a painting from the thumbnail. Incredible. It's the best I've seen so far. The shading and vectoring is top notch. omg good job it looks amazing! Good picture. Need still correction but colors are perfect. Awesome. 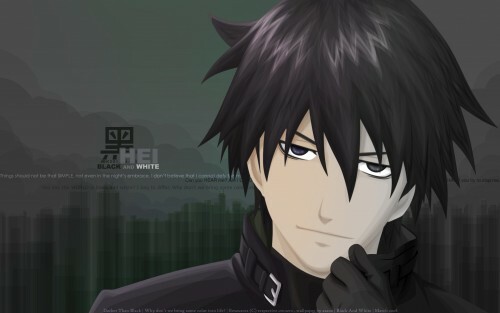 Darker Than Black's one of the best. Nice wallpaper anyway. The rendering's really nice.